We are pleased to kick start 2018 with the launch of our first ever “Valentines Raffle”, which has potential to raise substantial funds for our charity. 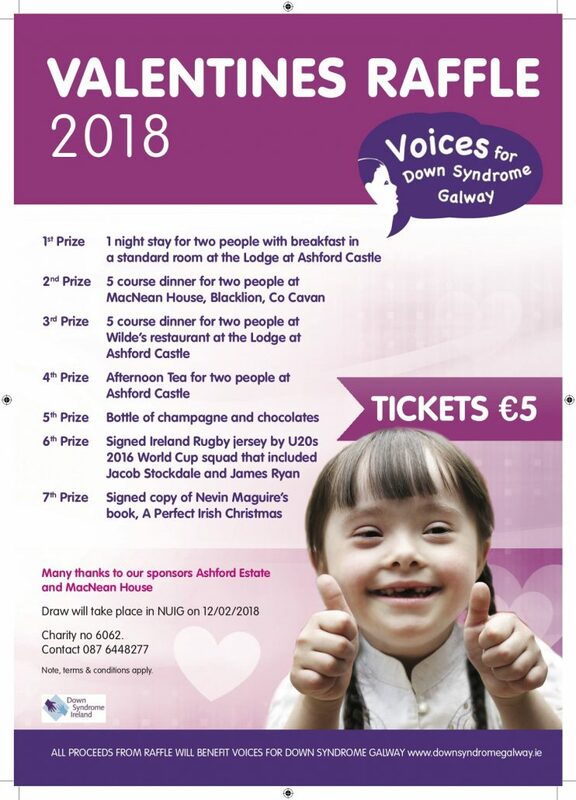 We thank all the sponsors for their generous sponsorship of fantastic prizes, enabling all monies raised from the sale of raffle tickets to directly benefit our speech therapy project Voices for Down Syndrome Galway. Tickets are great value at €5 each (book of 20 €100), with a fantastic range of prizes to be won. Top prize… a romantic overnight stay for 2 in the Lodge at Ashford Castle, with breakfast included. The raffle is the initiative of parents Aedin Collins and Dominique Majecki, who secured the prizes on offer. Raffle stubs and monies should be returned to a member of our committee, your child’s speech therapist or to our po box address (no cash to po box please) by Friday 9th February latest. Draw will take place in NUIG on Monday 12th February, winners will contact by phone.